I have the 3A hair type and for years I would color and straighten it, and now I'm having the issue of wanting to give up on my hair completely and just get it chemically straightened. I want my curly hair to work for me though, not conform to the normal straight hair you see everywhere. The ends are too frizzy and undefined, but I don't like the look of a wet dog with too much gel to control it, what do I do? The frizz is out of control at times and my hair falls out in clumps, any suggestions? I am so happy that you want to embrace your natural curls instead of straightening them. Stand out from the crowd girl! The combination of color and heat styling can wreak havoc and cause dryness, damage and frizz. It sounds like you're in need of some curl rehab, so I would first suggest my Curl Recovery line of products to nurse your hair back to health. What you need now is to repair your damage while strengthening and restructuring your curls. It's especially important for you to keep an eye on ingredients while you recover your curls, avoiding anything harmful that may aggravate your dryness. Shampoos have been known to cause damage to curly hair, so try out a cleansing oil instead. Also be sure to deep condition once a week. Our Curl Recovery Mask will help recreate your hair's depleted lipid barrier, restoring the protective layer to promote health and prevent future damage. 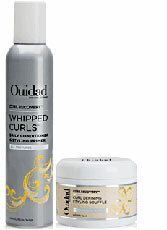 I also suggest consulting a Ouidad Certified stylist to assess your curls and trim your ends as necessary. Have a question for Ouidad? Send it to [email protected].